Apprenticeships, the original internship, have been around since the 11th century. Eager learners would often live with a master craftsman, serving the master for most of their young adult life. At the end of the arrangement, they would ideally be admitted into a guild as a journeyman, serving the craft for the rest of their life. For Erin Green, the modern internship thankfully looks much different. Erin is spending 10 weeks, not years, in Washington, D.C., interning with the Association of Schools and Programs of Public Health (ASPPH) as a data center intern. Instead of committing the rest of her life to one role, Erin is gaining valuable work experience for future career moves. Erin applied for the ASPPH internship because she thought it would help her step out of her comfort zone. 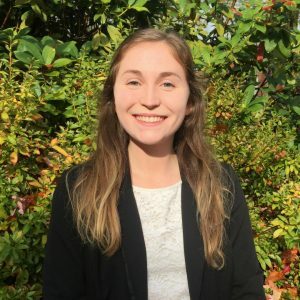 “I grew up in Salem, Oregon, and went to college in Corvallis, so I jumped at the chance to complete my required internship out-of-state and to work with a nonprofit such as ASPPH,” Erin says. Erin is developing a membership database and building an interactive dashboard for the ASPPH data center portal. Even though internships are required for CPHHS students, public health undergraduate internship coordinator Karen Elliot helps students pick local, national or international locations that align with their passions and interests. “When discussing different internship options with students in my pre-internship class, I make sure the sites they consider align with their future goals and provide them with additional skills, knowledge and relevant experience to help them be successful with their next endeavors,” Karen says. She says higher education needs to help prepare students to be successful young professionals and that internships help achieve this important goal. “I am so grateful for our internship site partners; they really give students in-depth projects and experiences to ensure they will excel in the workforce after graduation,” Karen says. This summer, 81 CPHHS students are getting valuable experience interning at locations around the world — including India, Ecuador, South Africa, Uganda and Ghana. Beyond interning in D.C., Erin proactively sought the experiences she wanted while attending Oregon State. She will graduate this September with a degree in public health – health management and policy (HMP) – from the CPHHS and a degree in policy and business innovation, with minors in economics and entrepreneurship from the College of Business (COB). Erin has been a CPHHS peer advisor for two years and participated in the Undergraduate Research Awards Program. She also recently received the COB’s outstanding student in strategy and entrepreneurship award. To mirror her undergraduate degrees, Erin plans to pursue a dual Master of Public Health and Master of Business Administration program.